This is a fairly small CA at just 65 hectares of which, only about two thirds (the North – West tract) has a five trail system of about 5 kms total. There are two accesses, and both are off Holt Rd. One from Concession # 7 (from the South), and the other from Regional Rd # 3 (from the North). 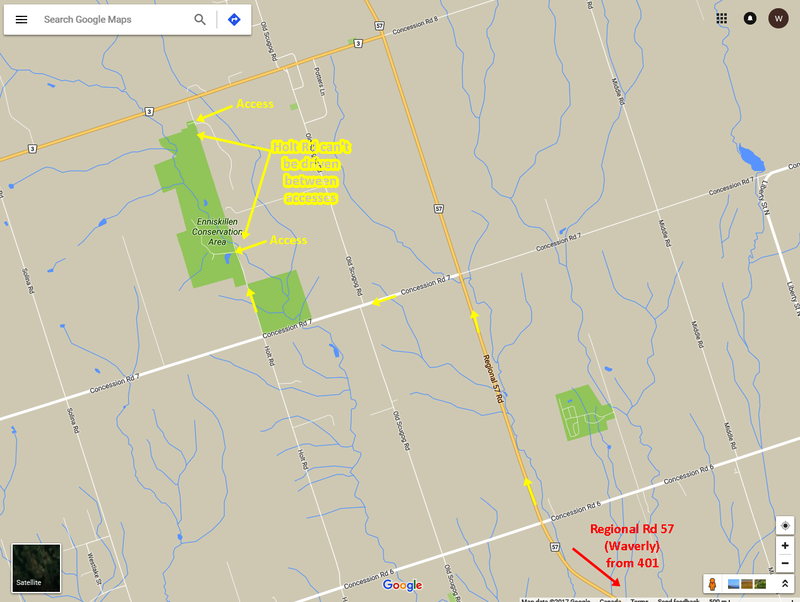 Holt Rd is not drivable between the two access points, so you gotta access from the North or South of the CA. The South parking lot (from Conc. # 7) is a pay and display @ $2.00/hour or $5.00 for the day, and the North (from Reg. Rd # 3) is free of charge. CLOCA (Central Lake Ontario Conservation Authority) must’ve had some grand plans of making big bucks off picnickers here as the picnic facilities are very impressive, and the grounds around them are rather well maintained. There’s a lot of advertising about renting the sites out for family or corporate functions too. So, yeah, a nice place for a picnic (but there’s no charge for just walkers, so like, we’re OK). There are permanent washroom facilities at all three main (rentable) picnic sites as well. 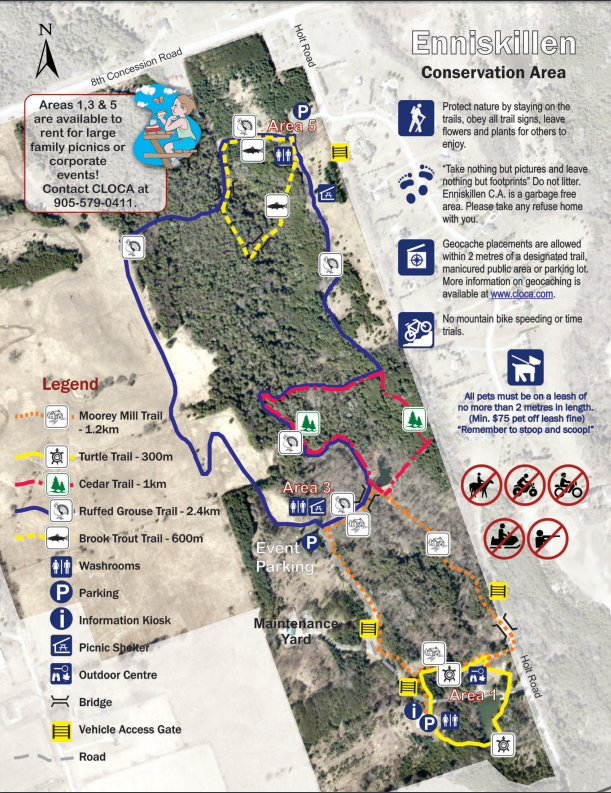 The trails are short by usual standards with the shortest at 300 meters, and the longest at 2.4 kms. There are some hills on the longer trails, but nothing that would even necessitate a rest part way up. Though the trails are short and the tract small, there’s an impressive diversity of ecosystems presented here. From deep dark canopied forests to open glens and meadows. From dry upland forests to streams and ponds. All trails are at least wide enough for two to walk side by side. This one is accessed directly from the South parking lot. It simply circles a small pond. There are two floating “docks” you can walk out on. The water is crystal clear, very shallow, and full of visible aquatic life. Half this trail is walking on paved roadway, and combined with the “feel” the rest of it had, I was reminded of the provincial park campgrounds of my childhood in the ‘60’s. As it’s name suggests, this is mostly a very clear understoried cedar forest walk with a bridge over Bowmanville creek. This one is Enniskillen’s longest trail and it covers the most ecosystems. To best enjoy, I would recommend you walk this loop clockwise. That way, the Hydro towers and that rich dude’s mansion will be behind you when you hit the open meadow stretch. Not knowing that, we took it the other way, and I kept having to turn around and look behind me, to appreciate the view. I wouldn’t bother with the Brook Trout loop trail (off the Ruffed Grouse trail) as it looks like the trail used to go straight ahead after crossing the bridge, but has been closed at the other end of it. So they made it into a loop trail back to the Ruffed Grouse trail. The “Trail Closed Permanently” sign along with the orange fence material seriously spoils the look. It’s only a 600 meter trail now, and the Ruffed Grouse trail crosses the same stream by the same design of bridge, and looks a lot nicer too. Enniskillen CA is a nice place for a walk and/or a picnic. There are five trails ranging from 300 meters to 2.4 kms in length through various ecosystems. There are some hills to climb, but nothing steep or strenuous. There are three permanent washroom facilities at the picnic areas, and two parking lots (the North one is free). The grounds are very well maintained at the common and group picnic areas, and the trails were quite clean and wide enough for two to walk side by side.